Spring had sprung (well, almost) and all the guys were raring to go. Wilson Street, a slushy street on the north side of Chicago, was home to “The Wild Bunch.” Kevin, the “ball-hog,” and his pals were raring to get outside and play soccer. Kevin, Danny, Tyler (his bro), Alex, Julian, Roger, Diego, and Joey began to pummel their walls shooting at imaginary goals. “BAM! BAM!” The excitement began to mount until things began to break and they got grounded. Everyone that is except for Roger who was “watching in helpless disbelief as the giggling daughters of his mother’s friends put curlers in his red hair.” It was no great loss because he was a lousy player anyway. When Alex “the cannon” put a ball through the only surviving window in the house, out the door and SMACK dab into his Dad’s head they all knew they were going to be g-r-o-u-n-d-e-d. And they all were (except Roger). BAM! BAM! BUMMER! Every self-respecting nine-year-old had enough brains to figure out how to get around rules and escape the clutches of their parents and before you know it they were headed for the soccer field. Unfortunately, Mickey the Bulldozer, the kind of guy who “attracts other jerks” just like himself, was just coming onto the field with the “Unbeatables.” Mickey may have been the “Darth Vader of our world,” according to Kevin, but when Danny called him a moron there was trouble in Chicago. BIG trouble! It was challenge time. “The Wild Bunch” was looking smack dab into the faces of trouble. Mickey, Humungous Henry, Octopus, Jaggenaut Jim, Mow-down, Kong, and Rick the Grim Reaper were going to hammer those “measly midgets” into the ground. The game was set, the deal was struck. The winner was going to be able to keep the field forever. Dozer kicked the ball and “hit the wooden fence so hard that one of the planks splintered into a thousand pieces.” The “Unbeatables” might have been losers, but they were much older, bigger, and some nasty. The only hope for “The Wild Bunch” was a coach named Larry, a guy with a bum leg who “reeked of beer” and wore an “eight-day-stubble.” Did they have a chance or were they going to get ground into the field like unwanted ants at a picnic? This is the start of a great series that every young soccer fan is going to go wild over. The reader will love the refreshing realism of the story and chuckle over some of the language and phrases. 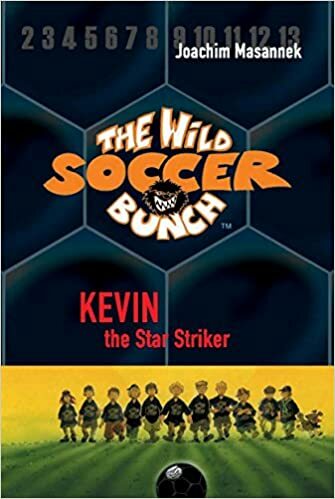 For example, when Kevin got mad at Larry he yelled out, “Kiss my cleats.” One of the boys is also homeless, living in a car and can’t afford cleats, doesn’t have a jacket, and has a mother who drinks. The story is full of fun, humor, excitement, and just the right amount of drama to keep even the most reluctant reader kicking his way through these pages to find out what happens in the end. No spoilers, here, but it was exciting and riveting. Quill says: If your youngster is a soccer fanatic, this is one book you’re simply going to have to add to your list!